Integrate your Twitter account with Rank Ranger for enhanced Twitter Analytics reports that can be viewed in our marketing platform, white label client dashboards and automatically sent in white label PDF format to your clients and managers. Authorization is quickest if you are logged into your Twitter account in another tab / window prior to connecting the account to Rank Ranger. Once you've completed your Twitter integration, it can take up to 24 hours for your first report to contain complete data. Twitter doesn't provide us with your historic data, however, Rank Ranger has an automated system that will collect and store your Twitter data daily in our Big Data center so over time you'll be able to view comparative Twitter Analytics statistics in your social dashboard. In order to provide you with Twitter Analytics reports and tools, Rank Ranger requires your authorization to read Tweets from your timeline, see who you follow, and access direct messages for display in your social analytics reports in our marketing platform. Authorization also enables you to follow new people, update your profile and post Tweets through our app. You can add as many Twitter accounts to Rank Ranger as you'd like, so we recommend that you name each connection for easy identification when connecting to rank tracking campaigns. 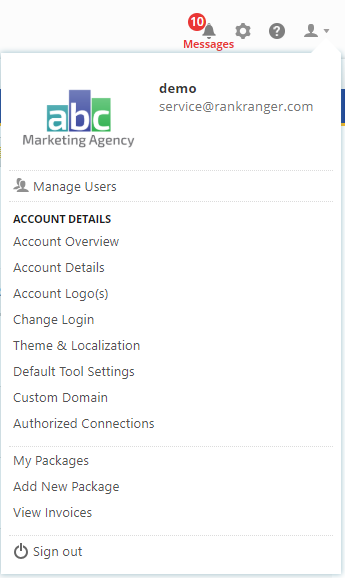 After authorizing integration of your Twitter account to our app, you need to connect a Twitter profile with a rank tracking campaign. In the Select Connection Name for Twitter field, click the down arrow and select the appropriate account. When the connection is successful, you will see the Twitter account avatar and name (if you don't then you need to click the Connect button). To switch to a different Twitter account, click the Disconnect link and repeat the campaign connection. Click the View Report link to launch the Twitter Analytics Dashboard where you may see some preliminary data while we create your first report which can take up to 24 hours. 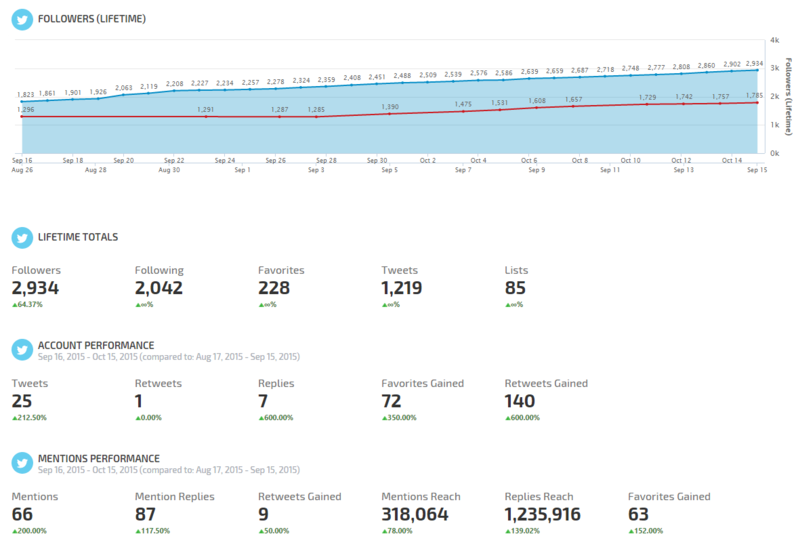 When available, you'll find additional Twitter reports and tools in the left sidebar of the Reports > Social Analytics screen. Twitter Analytics data feeds directly into our report from the authorized connection you create and for your convenience we are providing definition of their metrics. The Lifetime Totals section provides the aggregate total of Followers, Favorites, Tweets, Following and Lists pertaining to the connected Twitter account.